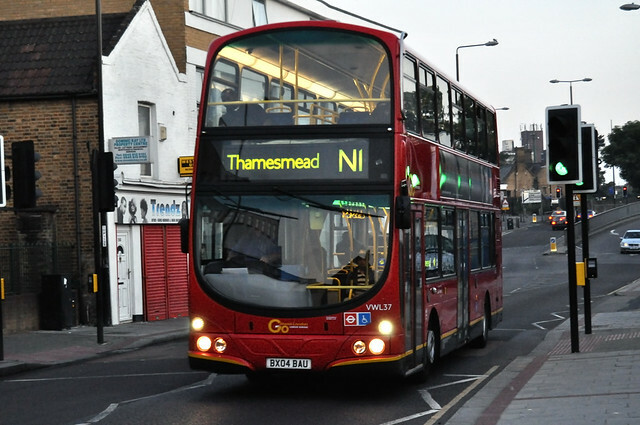 When I used to go out in north/central London and have to get back to Abbey Wood (what painful and long journeys they were), the N1 was annoyingly timetabled at the stop pictured to arrive 3 minutes before the 53 which terminated there, so I’d miss it often. As the 53 was what was often much easier to take from central I would take that rather than a long trek to get an n1, though that meant a long wait at Plumstead or a long walk. 2-3 hour journeys home from north London were not unusual. That kind of crap put me and others off going out too much in east or north, but SE London lacked much decent nightlife at all so it was all a bit annoying. The reliance on night buses must hamper London nightlife quite a bit. 24hr tube will be a great thing for many. Sadly not for much of SE London though, and 24hr DLR and Crossrail can’t come soon enough. I can’t see 24hr commuter trains for years, TfL takeover or not. Places like Woolwich have very little to do in the evening so if you want a decent night out you’d often be forced to go somewhere many miles away. They will have a poor option of tube to North Greenwich then 472 bus (2 an hour only). 4 buses an hour would be better until 2018, when hopefully Crossrail opens and is 24hr straight away.